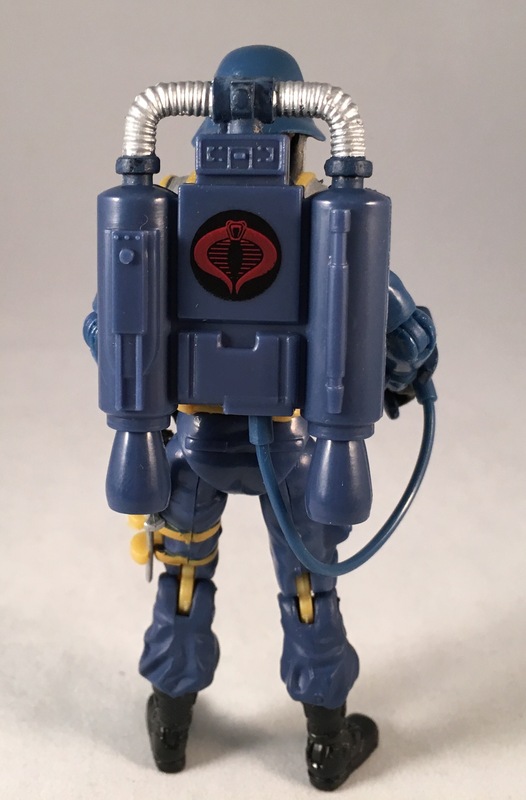 I went a little nuts buying the Cobra Legions box set. Just a couple years earlier, the army builder bug had bit me. I have a couple gallon bags full of new sculpt Vipers (both red and blue), Ninja Vipers and Night Creepers to show for it. I also have a few of the legions sets unopened. Looking back, it wasn’t a wise choice. The troopers in the pack were nice, but what can you do with five repainted Cobra Commanders and Storm Shadows? I was jazzed about the jet pack troopers. Seeing the JUMP jet pack again was quite exciting, and getting it in Cobra blue even cooler. 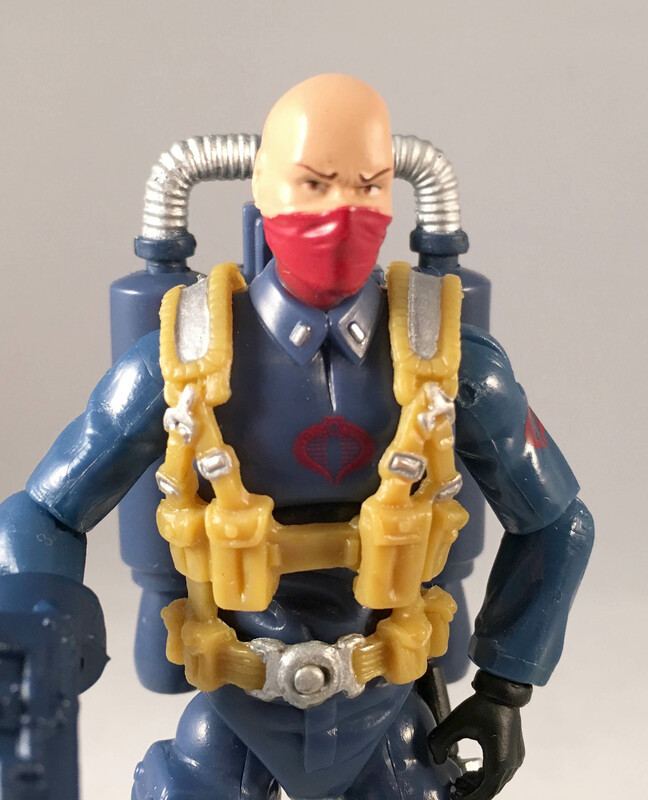 If the helmet looks familiar, it’s based on the gas mask equipped Cobra troopers seen in Marvel issue 44 and a 2006 o-ring comic pack. Speaking of the comic troopers, the web gear is done up in a comic style yellow instead of black or grey. The helmet design functions well as an oxygen mask, although I have to wonder where the air supply comes from. Then again, these guys most likely operate at low altitudes and don’t require fully functional breathing apparatus. I’m probably overthinking this, and in any case, the helmet looks really cool. Isn’t that what counts in the end? 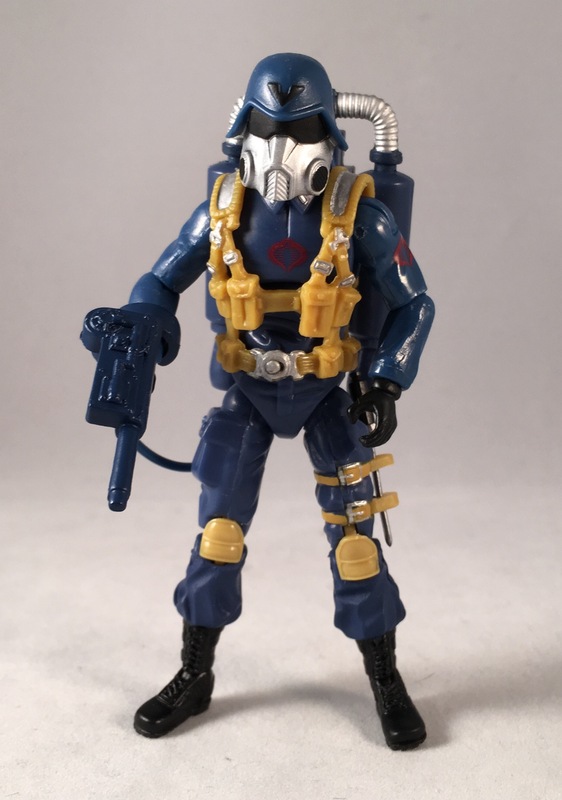 The figure also came with the standard Cobra trooper rifle and helmet. Alternate gear is always a welcome bonus, and the ability to create two kinds of troops in one is something I’d done as a kid, albeit with the use of a screwdriver. As a concept, this figure is top notch. How could we have not gotten an ARAH version of this guy complete with the JUMP? But, this figure has gotten very dated and he got there very quickly. 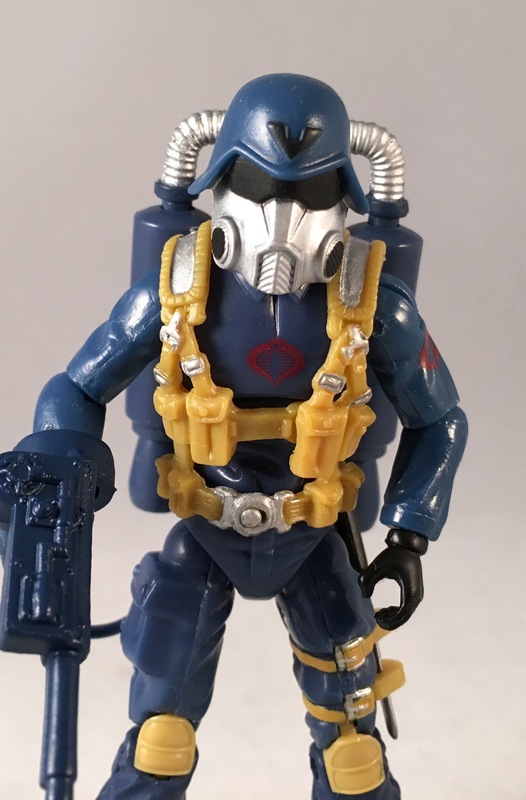 I actually bought this set, opened it up, reviewed this figure and then sold the loose figures for a substantial profit since the army builders were pretty insanely priced for a while. I think I got $20 for this guy and $15 each for the other army builders. How times change. It was a cool Idea! That is a great helmet/gas mask.